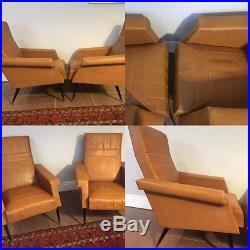 Pair Of French or Italian armchairs in brown vinyl, nice sprung base and comfy to sit in. On black tapering legs and in a used condition no rips. 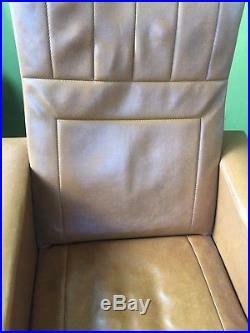 93cm high 74cm wide (arm to arm) seat 52cm deep floor to seat 40cm. 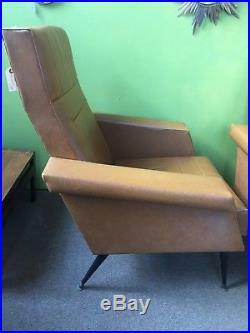 The item "Original 60's French Italian Armchairs Pair Mid century" is in sale since Sunday, February 25, 2018. This item is in the category "Antiques\Antique Furniture\Chairs\20th Century". 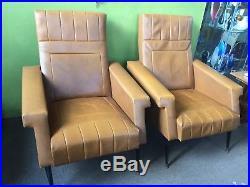 The seller is "palo400" and is located in HARROGATE, North Yorkshire. This item can't be shipped, the buyer must pick up the item.